Tandem skydiving is an easy and enjoyable way to experience the thrills of skydiving without having to learn how. The exhilarating free fall, combined with the peace and tranquility of the parachute ride, makes tandem skydiving a unique experience you will never forget. After a short briefing on arrival at the airfield, your qualified instructor will gear you up and together you will make your way to the aircraft. Once on board, you will be securely harnessed to your instructor and the flight will begin to 15,000 feet, your exit height. Enjoy the views on ascent as you will be able to see the three coastlines of South Devon, North Devon and across the Bristol Channel to South Wales, making the drop zone one of the most scenic in the country. Once at altitude, the door will open and then, with your heart pumping and the view of distant fields below you, it’s off to free fall before a large square canopy unfolds above your head for steered descent to the landing area. For more information on how you can challenge yourself and raise vital funds for Rowcroft Hospice, contact our Community Fundraising Officer on 01803 217419 or email [email protected]. 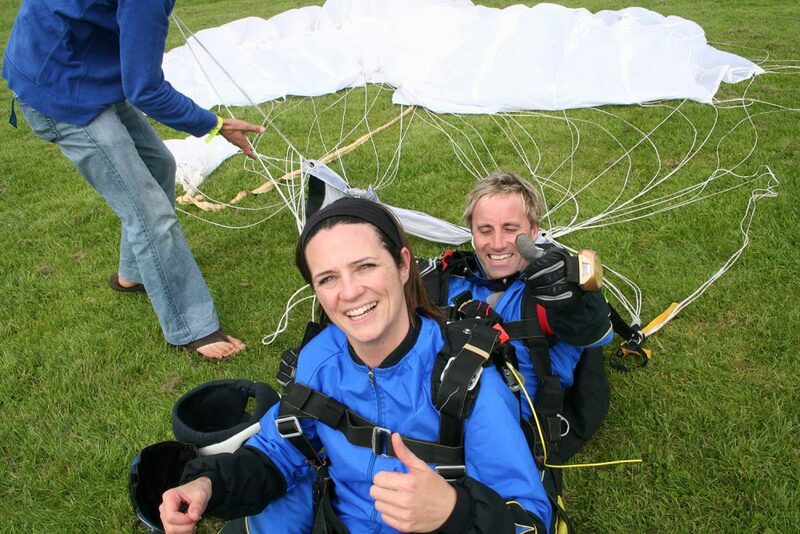 Alternatively you can book directly onto the Skydive, by visiting here. Your Skydive begins at 8am at Dunkeswell Airfield, Dunkeswell, Near Honiton, Devon EX14 4LG. Please report to the Skydive Buzz reception desk. You will be booked in and your money and sponsorship forms collected. If you are part of a group, please advise the staff that you wish to jump together. After a short briefing of about 20 minutes, your qualified instructor will gear you up and together you will make your way to the aircraft. Once on board you will be securely harnessed to your instructor and the flight will begin to 15,000 feet. Once at altitude, the door will open and you will jump from the aircraft, strapped to your instructor. You will freefall for up to 2 miles before your instructor deploys the parachute. As the canopy unfolds you will be able to take the controls and help your instructor steer the parachute around the sky before he takes full control for the descent to the landing area. The skydiving team do all they can to ensure your waiting time is kept to a minimum. However, skydiving is weather-dependent and you may have to wait for some time. There is an onsite café providing refreshments and snacks.